Are you getting ready for cold days? (Or hot days, for those who live on Southern hemisphere.) Are you getting ready for upcoming holidays too? 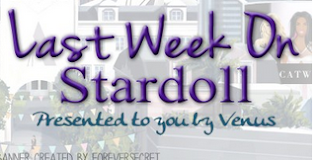 I hope Stardoll is preparing some nice surprises for us. But until then, let's see what happened last week on our favorite site, shall we? The week started with new release in Mawi jewelry store. On Wednesday, Stardoll released new Callie's Picks collection, simply named "tartan". Now if anyone remembers the 1st CP collection ever, you can see the theme is almost identical. Luckily, pieces are quite different, and we got some really nice, rare and valuable stuff. No SS/Roy only stuff, but no starcoin items either. I do plan on investing in some stuff, not to resell, but just because I like them. Like that grey blazer, yellow turtleneck, etc. On Monday Stardoll announced Endangered Species store was leaving, but not until Thursday we got a 40% off sale. No offense, but this was kinda unfair. Telling users store was closing so we can buy stuff, only to put them on sale 3 days later. I wasn't a huge fan of a store anyway, the campaign was what really mattered anyway, and I hope we have more of those. Anyway, I got only 1 item, so I am ok, but I can imagine users being kinda angry and feeling cheated. But there is nothing we could do about that anyway. And on Friday, Stardoll released new Young Hollywood collection. Ok, first of all, didn't we already have a YH collection, like, last week - which hasn't sold out yet btw? Still, I am not complaining, as we got some pretty amazing stuff. Rhianna outfit was the 1st to be sold out, which isn't weird at all, as it is truly gorgeous. That top can be worn in many ways aside from with that skirt - kinda like what I did with my doll. Selena outfit was kinda similar to Rhianna's, and Lady Gaga's outfit is surprisingly elegant and 'ordinary', but still fabulous. There were some more nice items and accessories, and of course, the collection hasn't sold out yet. Personally, I love wearing formal stuff on Stardoll, as I don't have many chances to do so in real life. That's it! I hope you enjoyed last week, and my recap as well. If you did, leave a comment, vote in a poll, and see you (hopefully) next Sunday.